So far we’ve met the Wands family and today it’s the turn of the Swords – which is entirely appropriate given the recent Spring Equinox. As with the Wands, I find that taking a look at the rest of the Swords realm gives me good clues as to what I can expect from the ruling family. Other systems are available, so just find one that works for you and stick with it! The first thing that I notice about these two cards is the wind lifting their clothing and hair. Their thrones are quite plain – which suits them, they’re plain-speaking sort of people. Behind them both we have a sky unfolding into a bright, but cloudy dawn. The landscape that they sit in is harsh, with little in the way of greenery to take the hard edge off. The Queen at least sits by a distant tree – but it looks gnarled by the wind at best or bonsai-ed to tiny, clipped perfection by the Queen’s blade. Neither of the two of them looks much like fun. The King engages with us, looking out directly, but the Queen faces off to the right, her eyes downcast, focusing on the blade in her hand. She is barefoot – on stone – her feet will be cold; she feels austere, distant. She looks self-contained. What do you think her positioning with her back to her Consort means. Even if you place them the other way around, she is still not engaged with him, her gaze is elsewhere. The King of Swords is Fire of Air – a productive mingling of elements that means he is well-suited to his Kingly role – able to take action, but more importantly, able to think through the ramifications of his actions before he steps away from his throne. But left unattended – air and fire can rage out of hand! He’s not got great emotional input into what he does – he’s hard on others, and hard on himself too. The Queen is Water of Air – another blending of elements that show that her emotional base and her thoughts are quite congruent (think of air and water coming together to make bubbles!) 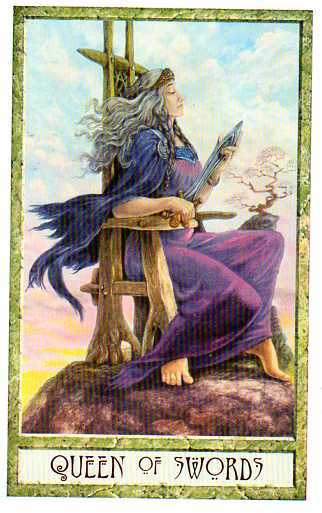 Although she doesn’t look it, there IS an effervescence about the Queen of Swords. Witty and clued-up, she’s ideal company at a party. Just watch out that she doesn’t get too handy with that little blade though – her honesty can be cutting. Traditionally, she is associated with a woman on her own. Not necessarily a widow or divorcee. One can be married and feel quite alone too. They both seem older than the Wands – the King with his high forehead (receding hair?!) and the Queen with her beautiful grey locks. The Prince of Swords is not on a hilltop like his parents – therefore he’s not got the same breadth of vision as they do. Look at the Wind in this card! The grass is blown flat, his cloak flies out behind him. This character is Air of Air – with no other elements to moderate him. He’s someone whose thoughts are still being formed and as a result, he flies about – latching on to one thing only to discard it when he learns something else. Consistency is not his strong point! Although his parents have their swords drawn, neither of the two of them look much like they are going to give you a jab. 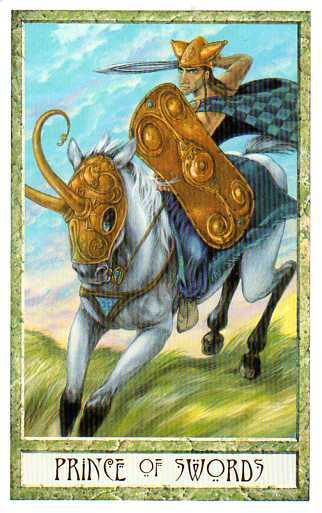 Not so the Prince of Swords – shield up, sword out, riding to the attack. He has much in common with the Prince of Wands – both rattle into action at the drop of a hat – but whereas the Prince of Wands is motivated by the thrill of the chase, the Prince of Swords is motivated by what he believes is right or wrong. Trouble is, he’s not always right about what he thinks is wrong! The most junior member of the clan is the Princess of Swords. Again, a lot of wind in this card! The Princess’s robes are whipped almost to shreds by the wind blowing around her. Like her mother, she stands barefoot, but unlike her mother, her stony surroundings are tempered into softness by the beauty of spring blossom. As far as elemental associations go, the Princess of Swords has the most trouble – she’s Earth of Air. 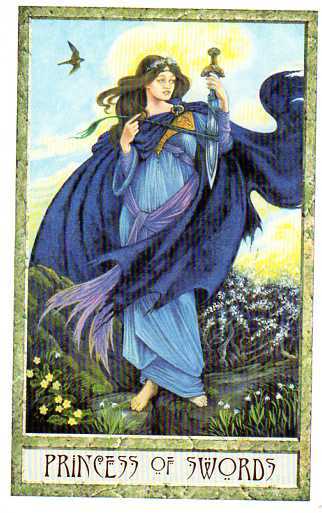 Look how she winds a green ribbon (earth) around her blade (air). That’s just going to get ripped to bits! Still, she’s got to learn…..also, she might want to think about how she’s holding her sword – that’s going to be a lot worse than a paper cut! What do you think about the Swords? The Sword family are provided courtesy of the DruidCraft Tarot. Published by Eddison Sadd (Connections). Artwork Will Worthington and words by Philip and Stephanie Carr-Gomm. I LOVE this Queen of Swords. She looks like she is taking a deep, cleansing breath of the breeze rustling her clothes and her hair. Each time I look at this card, I inhale deeply, pause, and exhale peacefully. As you say, this Queen is a woman Alone. Yes, she does, doesn't she – I hadn't noticed that about her before! The suit of Swords has always intrigued me, ever since I associated myself with the Queen of Swords. It tends to be frustrating to struggle between the head and the heart. I love to think of her as Queen Elizabeth I, she loved witty conversation and would not give up her power and beliefs by refusing to be married. I just found your blog, but will certainly continue to follow. Please add me to your contest! Hi Alyna! Thanks for stopping by! I'm very fond of the Swords and often find myself behaving in Swordsy ways. A brother that's a Knight of Swords – I'd like that! 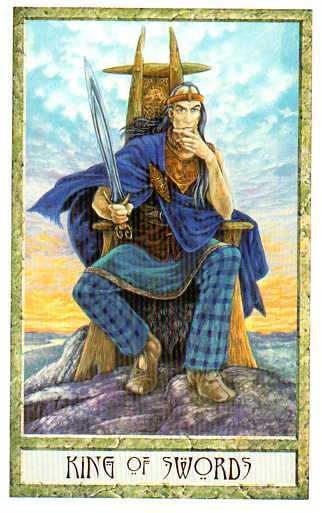 I have always found myself associating the Suit of Swords, specially the court cards, with logical thinking. My brother is a strong Air sign and ruled by Mercury and I know how intelligent, yet childish, he is.so like a Knight of Swords, he is ready to jump the gun for what he believes, Trouble is, he's not always right about what he thinks is wrong! beautiful! They are miserable because they live on the Shetlands where it is always cold and windy – so windy there are no trees …. Trim it Alison!! Trim it! You will never look back. Get a second copy and trim it!!! It's so easy to do on that deck in particular because it's thin stock AND has very definite, easy to see guide lines with those straight borders contrasting so vividly with the white. You ought to try trimming a Touchstone. Now that was tough. Have a DruidCraft sitting in my basket in Amazon!!!! Fabulous insights, Ali. thanks so much. I'm not sure about trimming. I like the idea of it (very swords!) but not what it might actually do to my deck if I get it wrong. I bet I'd end up with all slightly different sized cards lol! It's possibly my favourite deck to read with. Heck. I might just buy a second copy for the hell of it and trim it down! Thanks for a great description of the Sword family. It's a suit I have issues with. I'm definitely a Queen of Swords type…but the Swords, they're so—so—pointy and pricky! Get another copy – you know that you want to lol! I luff the Swords – they are quite blunt and, therefore, paradoxically, cutting lol!